As I knelt among the transplant flats, taking pictures of the green shoots, Bando jumped to my side, and all the hairs on his back went up, and he pushed at me with his trembling body. He growled the very specific growl that he saves for poisonous snakes. This is the fifth time—the fifth time—he has jumped at my feet to protect me from a poisonous snake. When he does this, I stand very still, and look for the focus of his quivering stare, until I see the water moccasin, copperhead, or, in this case, the coral snake, he is warning me about. Usually, I am able to grab his collar, and pull him backwards, away from the snake, and we take a different path, and let the snake crawl away. Coral snakes are shy and gentle, and they have tiny fangs, and typically they are not a threat to anyone. But their venom is extremely potent. 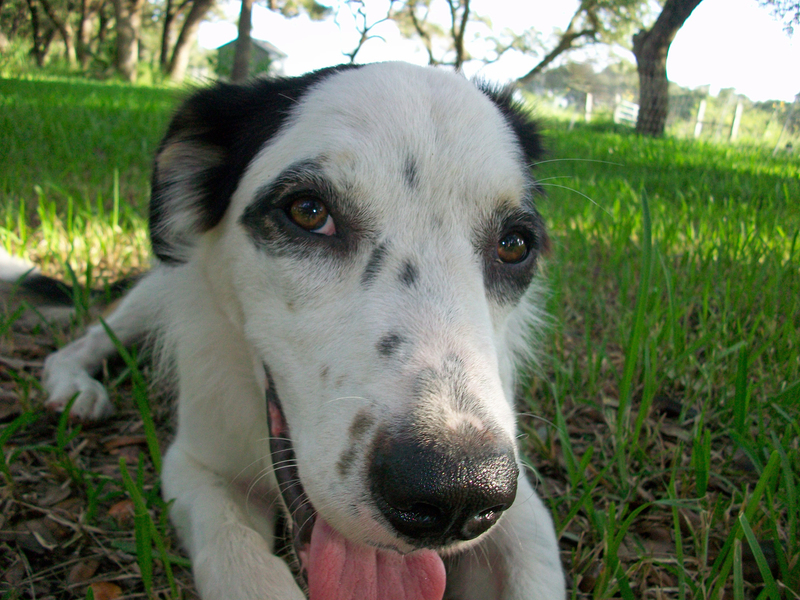 A coral snake bite on a dog’s nose would be very bad. This coral snake was coiled now, less than a step away from me, and striking repeatedly at Bando’s face. Bando was relentless in his fierce barking, and the snake had turned to attack. You never have a machete in your hand when you need it. All I had was the camera, a six-pack of chamomile shoots, and my size 12.5 work boots. My boot landed instantly, without hesitation, on the striking snake. I am sorry, coral snake. I wish you could have crawled away, to live another day. But under the circumstances, I hope you understand. You might have done a lot of harm to my good boy, my farm foreman, my little stinker, my faithful friend. Hi John! Thanks! Yes, we do too, when necessary. I found a rat snake in my hen house, over six feet long, and the snake had eaten about ten eggs, you could see them in his body, so I relocated the snake to the forest. The snake was back the next night, so I relocated it quite a long way from the hens. The snake came back again the next night and was full of eggs when I found it! We put the snake in the car and drove it to a breakfast restaurant for an all-you-can-eat buffet. 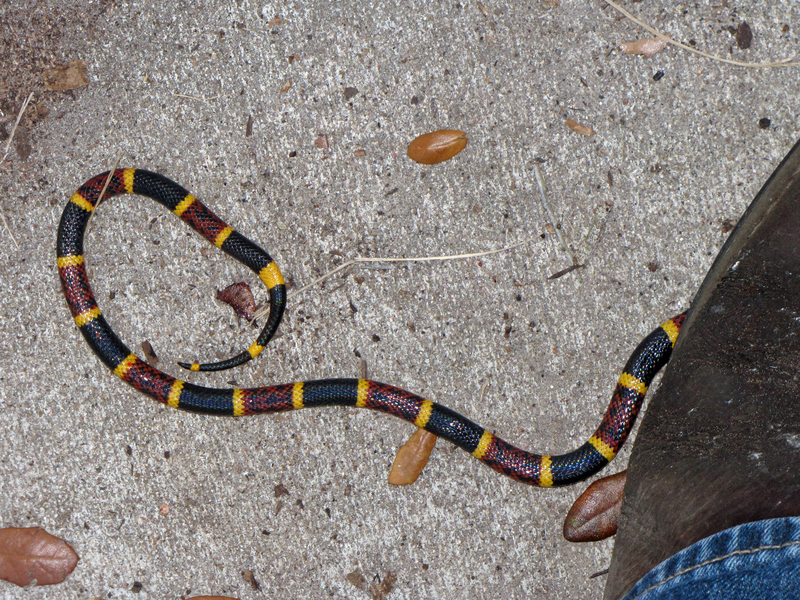 I didn’t have a chance, unfortunately, to relocate this coral snake. But I am so thankful that my good boy got through the day without a bite, and me too. All Bando asks for his faithful love and service is a good meaty bone and some “good boy” hugs. Thank you, Bando, for protecting your master. Yes! We used to fry him a pork chop every time he did something brilliant, but he does too many smart things, and we ran out of pork chops. Now we give him chicken foot and bacon dripping sandwiches, and he is okay with that. Good boy Bando. With that sweet face and brave demeanor of course the snake had to die! Hooray for brave Bando and your large boot! Great story and photos! Stay safe! You guys stay safe! Happy, Happy Sailing!